A wrist band with a 4.3 inch flexible OLED display is now being actively tested by the U.S. Army. 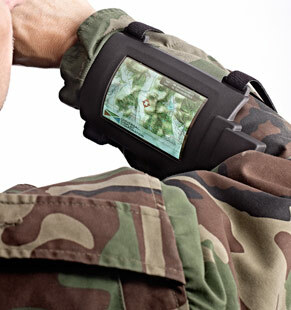 The prototype wrist-mounted flexible OLED display devices were designed and built as part of a U.S. Department of Defense (DOD) funded program to develop a thin, lightweight and ruggedized communications device. During simulated exercises at the Fort Dix facility, the wrist-mounted devices were shown depicting a number of different sources of information, including a real-time unmanned air vehicle (UAV) video feed and various other images received through computers running different applications. These devices have the potential to provide soldiers with advantages in the field that could mitigate risk and improve operational performance. Fans of the Fallout game series might be reminded of the RobCo Pip-Boy 3000. 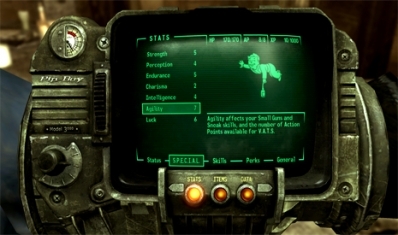 The Pip-Boy 3000 is a hand-held electronic device produced by RobCo Industries and is one of several Pip-Boy models that were issued as standard to Vault-Tec Vaults. 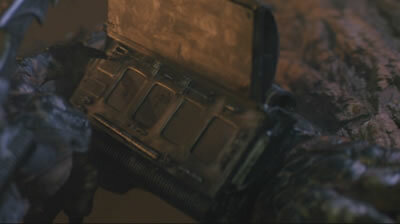 The device has numerous functions, and its capable of displaying the character's stats, area maps, inventory, Geiger counter, and radio. It is also possible to illuminate the screen to a level that is sufficient to light the area immediately around the user, acting as a makeshift lantern in darkened areas. Mark brushed back the soft green sleeve of his upper garment and pressed several buttons on the wide bracelet he wore upon his left wrist... He controlled [the bird's] passage with the wristband and saw through its eyes upon the tiny screen in the bracelet's center. Also, fans of the science fiction movie Predator will remember the alien wrist display; among its various functions - detonate nuclear blast. From (PDF) via MIT's Technology Review.